... more great Martha Stweart recipes on our GREAT CHEFS page! Preheat the oven to 350°F. Generously butter and four a standard 12-cup muffin pan, tapping out excess flour; set aside. In a small bowl, stir together the baking soda and boiling water; set aside. In a medium bowl, sift together the flour, baking powder, ground ginger, cinnamon, cloves, nutmeg, and salt; set aside. In the bowl of an electric mixer fitted with the paddle attachment, beat the butter and brown sugar on medium speed until light and fluffy, 2 to 3 minutes. Add the egg, and beat until combined. Add molasses, fresh ginger, and reserved baking soda mixture; beat until combined. (The batter will look curdled but will come together once the flour is added.) Add the flour mixture, and beat until well combined. Divide batter evenly among prepared muffin cups, filling each about halfway. Bake, rotating pan halfway through, until cake tester inserted in the center of a cake comes out clean, about 20 minutes. Transfer pan to a wire rack to cool for 15 minutes. Invert cakes onto rack to cool completely. Set rack over a parchment-lined rimmed baking sheet. Spoon about 1 tablespoon of Chocolate Ganache over each cake, letting some drip down the sides. Garnish with a couple of strips of crystallized ginger. Once glazed, cakes should be refrigerated, in airtight containers, for up to 3 days; bring to room temperature before serving. The definitive book on baking for home cooks. Nothing says comfort food like freshly baked cookies, a cake, muffins or homemade bread cooling in the kitchen. Creating those mouthwatering baked treats to share with family and friends is one of life's great pleasures. The Complete Baking Cookbook provides the inspiration to explore the wonderful world of baking. And of course it includes the tested recipes to make it easy and tasty. 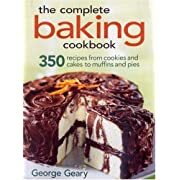 Written by baker and pastry chef extraordinare George Geary, this collection of 350 easy-to-follow recipes offers a tantalizing variety of goodies from pies, tarts, cobblers and crisps, to cookies, cheesecakes and holiday pastries. What really sets this baking book apart from others is that there is a special section with comprehensive material for each category of baked good. For example, the cookies chapter includes instructions and line drawings on effective techniques (scooping, using a pastry bag), troubleshooting and tips, choosing the right pan, and comparison charts. How does an ordinary person make a sophisticated, crowd-pleasing cake in a snap? With a bundt pan, of course! Foodie Susanna Short brings back the beautiful bundts of yesteryear with mouthwatering, kitchen-tested recipes for busy families, elegant entertainers, and confection connoisseurs everywhere in Bundt Cake Bliss. 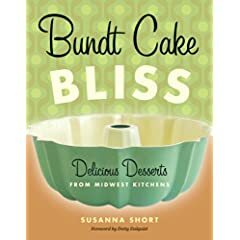 From vintage favorites like Quick Orange Kiss and Tunnel of Fudge to fanciful finds like Green Chili Cornbread and Mexican Hot Chocolate Mini Bundts, this delightful book features just about every delectable bundt baked by the Midwest’s own since the handy pan burst into the baking scene in the 1960s. And don’t forget the dozens of glazes, sauces, and frostings sure to transform any cake into a shining crown of glory. Here is a cookbook that makes baking accessible to all, where fun is an essential tool in the kitchen. Among the delicious recipes and stories of the cakes and their creators are tips for dressing up bundts for special occasions and for managing those unexpected mishaps. And to top it off, Short offers warm and humorous reflections about the power of bundts in building community. With Betty Crocker, delicious desserts are a piece of cake! Take your favorite Betty Crocker SuperMoist cake mix flavor, add a drop of this, a dash of that, stir, bake, decorate, and you’ve created dessert magic beyond your sweetest dreams! Here’s your complete guide to baking with cake mix, packed with foolproof recipes from the ultimate cake mix experts--the Betty Crocker Kitchens. All your favorites are here, easy to make, easier to bake and easiest of all to enjoy! 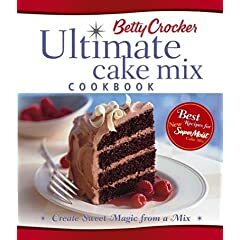 So whether you’re a first-time baker in search of tempting treats or an expert ready for a challenge, you’ll find plenty of great ideas in Betty Crocker’s Ultimate Cake Mix Cookbook. * Planning a big birthday bash? Decorate a pretty Ballet Slippers Cake to see any aspiring ballerina twirl in delight. * On the go to a potluck party? Tote along a super-rich Triple-Fudge Cake and all you’ll bring home is the empty pan. * Craving a cookie jar filled to the brim? Bake a batch of Old-Fashioned Peanut Butter Cookies for a sure-fire snacking treat. * Hankering for holiday cheer? Create oh-so-cute Rudolph Cupcakes to make any holiday party merry and bright. On the corner of Bleecker and Eleventh Streets in the heart of Greenwich Village sits the Magnolia Bakery. This unassuming shop, where the smells of home-style baking weaken even the strongest will, has attracted a clientele that ranges from kids on their way home from school to celebrity glitterati. Cupcakes swirled with pastel frosting crowd the counter, and cakestands display Lemon Vanilla Bundt Cake, Apple Walnut Cake with Caramel Cream Cheese Icing, and Coconut Layer Cake, swathed in fluffy white frosting and covered in drifts of coconut. As Time Out New York says: "The secret to Magnolia's success is simple: Nobody knows how to bake like this anymore."